New research from a team led by Lawrence Livermore National Laboratory (LLNL) scientists reveals that the radioactive isotope zirconium-88 (⁸⁸Zr) is 100,000 times more likely than expected to absorb any room-temperature ("thermal") neutron it encounters. The research appears in the Jan. 7 edition of the journal Nature. 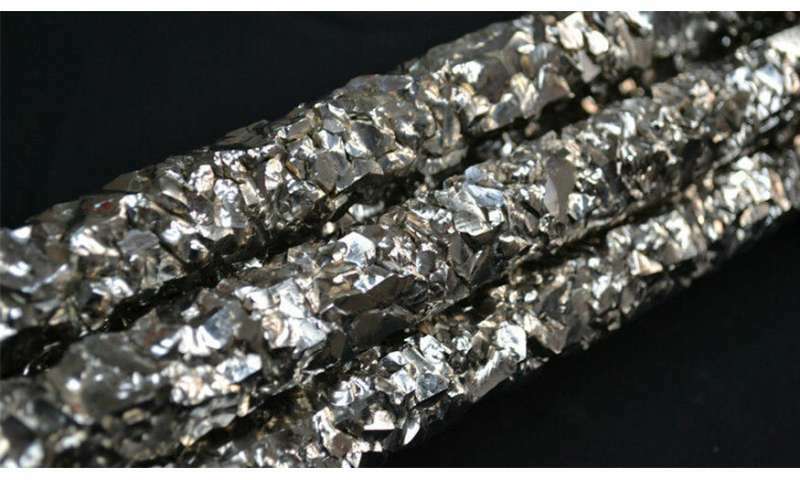 Zirconium-88 is a particular type, or isotope, of zirconium, distinguished by the number of neutrons it contains. Typical zirconium contains about 50 neutrons, but ⁸⁸Zr, which is radioactive and not found naturally on Earth, has fewer than normal, with 48 neutrons. While neutron absorption (known as a neutron-capture cross section) has been studied in detail for many stable isotopes, not much is known about this property for radioactive isotopes. The newly discovered ⁸⁸Zr thermal neutron-capture cross section is larger than that of any stable isotope. This means that when the ⁸⁸Zr nucleus encounters a thermal neutron, it is very likely to capture it and incorporate it as part of the nucleus. Thermal neutrons are found in nuclear reactors, and any other neutron (from a nuclear reaction or nuclear decay) that starts out at high energy, will bounce around until it reaches room temperature. "The big surprise here is that ⁸⁸Zr, a radioactive isotope of zirconium with two neutrons fewer than the lightest stable zirconium isotope, has a thermal neutron capture cross section that is so much larger than expected and is in fact the second largest ever discovered," said LLNL physicist Nicholas Scielzo, principal investigator for the research project. "The last time a cross section of this magnitude was discovered was when nuclear reactors were first turned on in the late 1940s." The finding is significant because it showcases how little is known about how radioactive isotopes interact with neutrons, as well as implications for ⁸⁸Zr in national security missions. "Neutron-capture reactions are important for a variety of applications and for how the heavy elements were built up," Scielzo said. "For example, these reactions impact reactor performance by taking away neutrons that could otherwise cause nuclear fission, and they are responsible for transmutation of some of the diagnostic isotopes used in stockpile stewardship." The neutron-capture cross sections for most radioactive nuclei are poorly known, despite the importance of this information to a range of topics in both fundamental and applied nuclear science. Understanding the origin of the elements in the cosmos is one of the most important overarching challenges in nuclear science and requires neutron-capture cross sections for the many radioactive nuclei produced along the nucleosynthesis pathways. Essentially all the elements heavier than iron were created via successive neutron-capture in environments such as giant branch stars, core-collapse supernova and neutron-star mergers. Nuclear reactors and weapons have exploited neutron-induced reactions to harness enormous amounts of energy, relying upon detailed neutron inventory for predictable performance. In a nuclear reactor, nuclides with large neutron-capture cross sections act as a poison in the fuel and diminish performance or can be introduced intentionally to control fuel reactivity. The science-based stockpile stewardship program, which is used to maintain high confidence in the safety, security, reliability and effectiveness of the nuclear stockpile in the absence of nuclear testing, relies in part on cross sections for radioactive isotopes to interpret archival data from underground tests (UGTs) of nuclear devices. The transmutation of stable yttrium and zirconium detector material loaded in UGTs produced radioactive isotopes, such as ⁸⁸Zr that served as important diagnostics sensitive to neutron and charged-particle fluences. However, the nuclear-reaction network calculations, which model the production and destruction of these radioactive isotopes, rely on cross sections for which there are limited or no data, making it challenging to interpret the historical data. "What I find especially intriguing is that the two largest thermal neutron-capture cross sections are both on radioactive isotopes (xenon-135 is the largest, ⁸⁸Zr is the second largest) and neither were expected, so maybe there are many more surprises to be discovered as we continue to investigate radioactive isotopes," Scielzo said. "Maybe this is a hint that these reactions won't be quite what we expect and this would have a big impact on our understanding of how the elements from iron to uranium were formed in the cosmos."